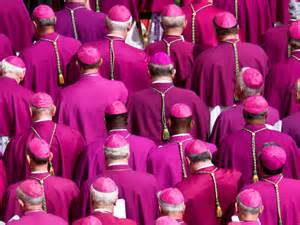 LES FEMMES - THE TRUTH: Is the Deck Stacked in Favor of the "Progressives" at the Ordinary Synod on the Family? Wow! Hard to ignore that. Will Kasper, the German bishops and their "progressive" cohorts support the Moses approach (allowing divorce because of the "harness of heart") or uphold Jesus' doctrine? It's also noteworthy that October 7th is the Feast of the Holy Rosary which was created in Thanksgiving to Our Lady for the defeat of the Turks at the Battle of Lepanto in 1571. The pope had called all of Europe to pray the rosary! Are these two factors surrounding the upcoming meeting "just a coincidence?" Not hardly. There are no coincidences in the spiritual life, only God--incidents. It should definitely be a reminder to us to be praying the rosary for the bishops and begging Our Lord and Our Lady to save us from a repeat of the scandal following Vatican II. We sure don't need a "spirit of the Synod" to be the diabolical twin of the "spirit of Vatican II." We're still trying exorcise that evil demon.